For the last several years, Rhodium has been the go-to source for independent, rigorous analysis of the economic, energy market, and emissions implications of a range of federal and sub-national energy and climate policies. Our annual Taking Stock report provides objective, up-to-date analysis of how legislative and regulatory action at the US federal and state level is bending the emissions curve, in a framework consistent with accounting methodologies of the US government and United Nations Framework Convention on Climate Change. 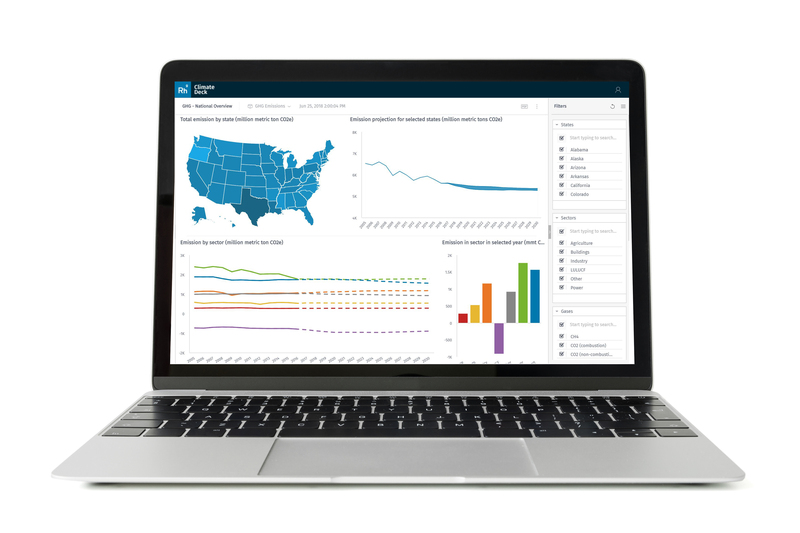 The US Climate Service, launched in 2018, expands this toolset to include a 50-state emissions inventory and projection system that covers all sectors of the economy and the full range of atmospheric greenhouse gases, including methane, nitrous oxide, and hydrofluorocarbons (HFCs). Clients receive direct access to this proprietary emissions data, as well as our US energy and emissions forecasts. Clients are granted online access to Rhodium’s economy-wide emissions inventory, segmented by each of the six gases the US targeted for reduction under the Kyoto Protocol. This inventory includes carbon offsets, documenting land use, changes in land use, and forestry for all 50 states. Clients have access to detailed model output from regularly updated economy-wide energy and emissions projections from RHG-NEMS, a modified version of the Energy Information Administration’s National Energy Modeling System, which is used to produce the Annual Energy Outlook. RHG-NEMS includes updated renewable energy, battery and other technology costs, macroeconomic and behavioral dynamics. It produces emissions projections for all 50 states, by year, through 2030 with projections updated on a biannual basis to account for all major policy changes at the federal and state level. We also project changes in major energy market variables, including power generation capacity, electric vehicle sales, transportation fuel demand, and building energy consumption. Clients receive regular and timely Rhodium research notes analyzing major clean energy and climate policy developments at the federal and state level. Research topics range from state-level renewable energy policy to action by the Federal Energy Regulatory Commission. Our analysis helps clients understand the impact of legislative and regulatory action on economic output, energy markets, and emissions. Rhodium analysts use our 50-state dataset to provide unique insights on opportunities and challenges surrounding climate and energy policymaking at the subnational level. Clients access Rhodium GHG inventory data and energy and emissions projections through ClimateDeck, a secure web portal tailored to each client’s workflow and needs. Clients can request the addition of any third-party data they would like to track and visualize regularly, including that from the Energy Information Administration, International Energy Agency, and Environmental Protection Agency. To learn more about Rhodium’s US Climate Service or to request a demo, please email uscs@rhg.com or call +1.212.532.1157. It is the most important question for one of the world’s most important economies: is China carrying out the economic reform program it laid out in 2013? Our project with Asia Society Policy Institute tracks progress.